When we eventually got to rehearse with the band the kids slowly began to realize that for every hip pop I taught them there was a coordinated cymbal crash, and for every shimmy there was a perfectly paired drum roll. It started to make sense to them once they put the moves to music; little by little the things I was asking them to do didn’t seem so crazy anymore. Any lingering doubt would be erased on opening night when the pops, shimmies, and jazz hands would garner a loud mid-number applause from the audience. At that point the kids would pop, shimmy, and jazz hand even bigger, with smiles to match. As a choreographer it’s rewarding to watch your once primitive ideas -the ones that for a long time only made sense to you – come to fruition in such a positive way. While it’s fun to witness the cast slowly realize and take ownership of the final product, you’re not surprised it happened. After all, you were able to hear the music all along. 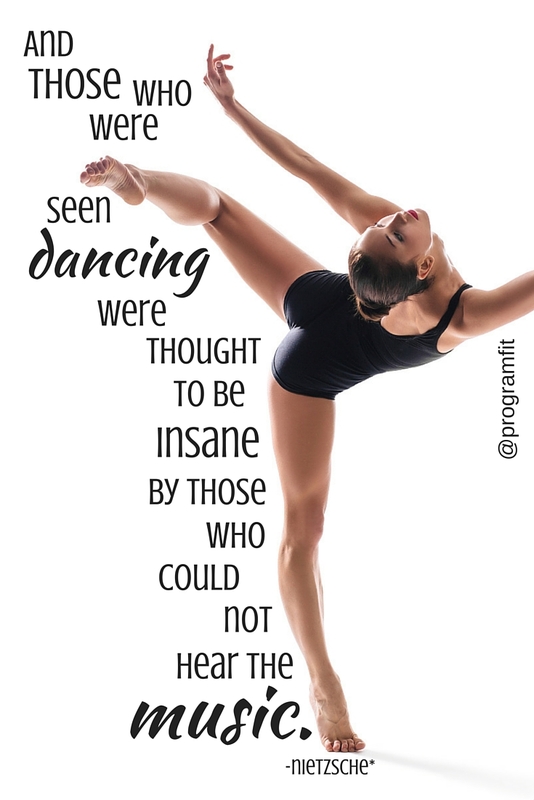 My past experiences help illustrate this quote for me in a personal way, but it’s also often been translated to illustrate how strange it might look watching a person dance when you can’t hear the music to which they’re listening, versus when you can. And it so easily rings true in other areas of life; especially if you’ve ever found yourself being questioned by others for the choices you’ve made. Chances are if they don’t understand your lifestyle it’s because they don’t understand your circumstances. They don’t know what inspires you. They don’t know what drives you. They can’t hear the music. I hope this quote reminds you that if someone criticizes your “dance,” it’s not your responsibility to play the music louder. At some point your critics will either be be quiet enough to listen for it, or they’ll choose to remain forever tone-deaf. Either way, continue building your dance 8-count by 8-count, because when the band finally arrives the performance will be magical. *I included the asterisk next to the author’s name due to some debate as to the origin of the quote. This article does a nice job of delving into all the variations.